Saccharine and overly sweet, but could be seriously funny. After watching the first episode, yeah, it's a pretty typical high school romcom, but there's hidden potential for some profoundly funny and awkward humor. With the main character being a clingy, almost stalker-esque girlfriend of the male lead, there could be some golden moments of dark humor ahead of us. Some Overly Attached Girlfriend scenes would definitely spice things up in this, but time will tell if that'll happen or not. As it is, if it keeps on this ultra-kawaii tangent, it won't be a BAD series to watch. You could certainly do worse like say, Cerebus or Lance n' Masques... but you won't be particularly engaged, either. It's like popcorn anime, you scarf it down and look for another bag. Depending if the series stays 'innocent and sweet' throughout, it'll be a series to watch when you need some cheering up or need to feel like the world ISN'T all gloom and doom. If it takes a twisted turn and goes a little Yandere Simulator, I certainly wouldn't complain because that would be friggin' hilarious. I mean, as long as they don't go FULL Yandere Simulator, we don't need another School Days happening. Seeing the clingy girlfriend glare threateningly at a possible love rival in a deranged, psychotic way, however, would be a treat. Early verdict: Not bad. Nothing made me cringe or facepalm. Will fill a show hole nicely. Future stars are being held in reserve for future episodes. My Love Story! !, Love, Chunnibyo and Other Delusions, Wagnaria/Working!!! I really enjoyed the fact that the main character is a girl who is borderline stalking the boy she likes and she's technically his senpai. Also the fact they both are clueless about how to act or talk about while being in their new found relationship. I found this anime very cute and worth my time. I'm very curious to see how they develop the main characters and their friends. All in all i would recommend this anime to just relax and unwind. Very sweet, quite funny, but I am unable to recommend it to anyone I know because of how much it reveals about the trash mind of an otaku in love. Simple animation, very cute and round character design, well balanced and simplistic story, over the top writing that allows it to fall unbelievably within the world of realism. Sensitive viewers beware of this extremely sweet treat! Funny, cute and relaxing, this love story will still bring up thoughts and questions about stalkerism, gender roles, relationships and closing the distance between love interests in a serious way. Visual and aural production are highly pleasurable and even though the supporting characters are quite bland the slow-paced storytelling will keep you in a gigglish fever, looking forward to the next episode. I recommend it to anyone who isn't afraid of dying from diabetes after seeing this kawaii couple blush a million times. You are not going to find any epic story lines here. You will not find action, or adventure. You will not go "Woah, I didn't see that coming," or cry. You will most likely go "AWWWWWWWWW" or laugh. This is cute. This is funny. This is harmless romance that only the most cold hearted can find truly offensive or awful. There is barely any relationship progress. Most of those side characters have no real purpose. Boring settings, boring dialogue, boring interaction. I apologize if my review is harsh, but after watching Tsuredure Children (http://www.crunchyroll.com/tsuredure-children), my bar is set really high for romance anime. A fun and honest Awkward love story. I'll go ahead and keep this review brief, but this series is charming. While my main anime has been for much of my life more action and adventure, as I age and mellow I find myself enjoying some of the little romantic comedies and slice of life's more and more every year. I won't say that they are becoming my favorite genre, but I do find myself creeping more and more to them over the typical anime that a male viewer typically goes for. With that, I will say that this was a nice surprise for me. I typically try to go through as many new shows a season as I can giving every show at least five episodes and whittling it down from there. This and one other one from last summer were two that I ended the season with...why I'm just now getting to writing a review I may never know. Over all this goes into the perfect little awkwardness that is young love. Oh it is dialed up to eleven in some cases, but that is to make the story more funny. In truth I love it more because of that, but when moments need to be more toned down it does that and we see to young kids build their relationship. They are not perfect. They are not always clear headed, but it is honestly accurate because neither were any of us a teenagers. Seeing a boy who is known to love sweets purposely drink black coffee and a tart pie just to impress his girlfriend is hilarious and adorable. Seeing a girl collect and document everything he tosses aside, just because she is so damned attached to him is creepy, but does remind me of one ex I had many many years ago. I say watch this series with a three and half out of five star rating. It will take you back. This show is freaking weird. It's a little cute, and everyone is super innocent. I think my favorite character is Mizuyama, honestly. She seems the most level-headed and sane. Kurihara is seriously messed up in the head. Momotsuki is an A-grade wuss. I guess I would have been too, at that age. I don't know. I think this show was good, but just lacked in sanity. It was almost too crazy, or maybe wrong crazy? It has a weird art style too. It's weirdly semi-chibi. I did find it pretty charming, just lacking in some believable material. Kurihara is almost too creepy. I saw the characters and they looked super cute. I wasn't expecting much when I started watching it, but I couldn't put it down after I did. It is a hilariously awkward romance between middle schoolers. It was kind of refreshing to see the girl character be the weird awkward creepy stalker. They're super cute, I recommend watching it. Solid, above average look at the H.S. "first love". Supporting characters are really the stars of this series. Without the "gang", Momo and Yuki couldn't carry a show in a bucket. I like the "soft" feel of the characters and colors. Others may not. I really like it as it's true to the manga. 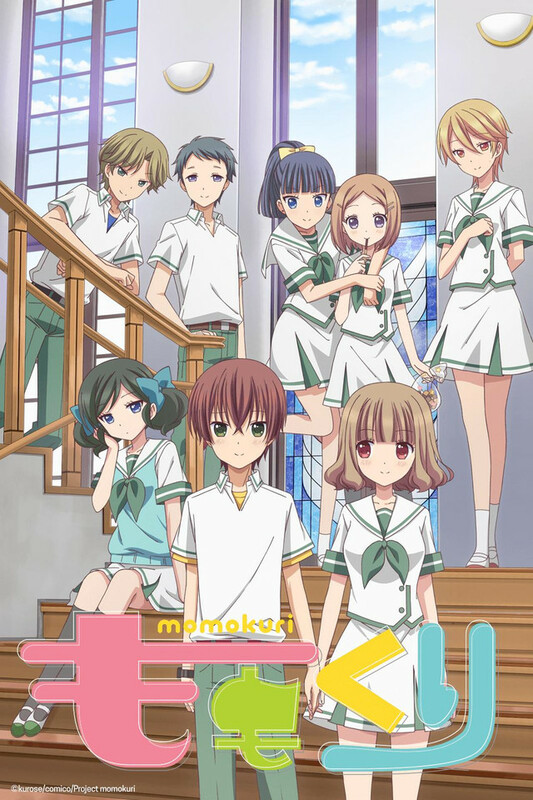 In the murder-death-kill world of anime "momokuri" is like petting a puppy: calming, and relaxing.